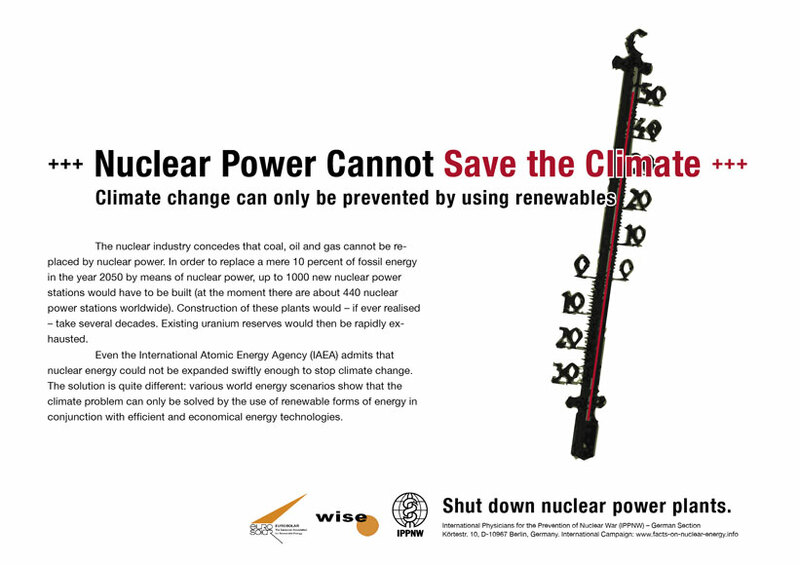 The nuclear industry concedes that coal, oil and gas cannot be replaced by nuclear power. In order to replace a mere 10 percent of fossil energy in the year 2050 by means of nuclear power, up to 1000 new nuclear power stations would have to be built (at the moment there are about 440 nuclear power stations worldwide). Construction of these plants would - if ever realised - take several decades. Existing uranium reserves would then be rapidly exhausted. Even the International Atomic Energy Agency (IAEA) admits that nuclear energy could not be expanded swiftly enough to stop climate change. The solution is quite different: various world energy scenarios show that the climate problem can only be solved by the use of renewable forms of energy in conjunction with efficient and economical energy technologies.